Almost in any process, there are many stages that are equally important for reaching the best results. The same can be said about mobile app development, and even more so. It may seem from the first glance that development itself is the most difficult, time-consuming and accuracy-demanding part. However, there is also testing that requires no less attention. The whole possibilities may go unfulfilled if there will be any issues going wrong while users try using the app. There is never any way back after the app is deleted from the mobile device. So, it is definitely worth paying attention and using the best practices of testing as to one of the main stages of the app development. Of course, not all of the steps can be described at once, but at least you will get a general idea of how it’s done. First of all, there are some general rules that should not be ignored. Would you like to make sure that your app does its best upon launching? Go ahead and test it to eliminate all the possible faults. Even minor improvements may lead to greater success on the market. Mobile testing is very similar to software testing, so there are plenty similar terms and procedures. For example, equivalence classes, boundary values, acceptance criteria and others. Having that knowledge in mind while testing can help a lot. The same functional and nonfunctional testing skills apply to mobile testing. You can start with following the standard procedure and then proceed to the mobile usability testing itself. Hundreds of applications are being launched daily, and it would be weird if users’ expectations wouldn’t grow proportionally under such circumstances. To satisfy all their wants and needs you need to know for sure who are your customers. You should know their gender, age, locations, monthly income, user habits and whatever else can help you draw a clear customer’s picture in your head. With this image in mind, you can look at your project through their eyes and test the way they’d use it. Of course, for technical geek some operations are obvious, but will they be obvious for a middle-aged housewife? Or a teenager? Just concentrate on your target audience while performing mobile UX testing, and that will pay off. It can even reduce the number of devices you need to test your app on because some of those devices may not even be used by your future customers. To get such information you can look through the app markets statistics, do market research and ask direct questions. Either method is fine to get the information you need. Basically, the task here is to look at the app through the potential user’s eyes. The better you can pretend to be this user, the more they are going to love the result. This is one of the most important rules for mobile app usability testing. The point is that most mobile applications need to be connected to the Internet to do their job. There are many different networks that device can connect to, especially when the user is moving around. It can be WI-Fi, 3G, LTE, GPRS or EDGE. Some of them are fast, some of them are way slower. You need to make sure that the app can work with all of them and that it can get hold of regular network transitions. From fast to slow one and back, it can lead to bugs. You don’t want that to happen because one mistake is often enough for a user to stop using the app. Especially, if it is something like GPS-navigator or a map that people rely on (however, it doesn’t mean that other apps may be excused). To make sure your app handles fast transitions, try testing it with as many network carriers as possible. And even a bit more. When do you think your customer starts using the application? If you think that upon opening it for the first time, you are wrong. It starts when the application is being clicked on at the app store. So, the testing process should start with installing the app on the mobile device. It is the first step, and the performance should be perfect. The same goes for updates. Everything should work nice and smooth even before it’s time to open the app and start actually using it. There are special mobile app usability testing tools that allow simulating the updating from older to the newer version. Pay attention to the fact that the user should stay logged in after the update, otherwise the changes will have no impact on the user’s existing data on the device. Look for crashes or any other problems that may occur. The first impression starts with the installation, and it is super important for the future experience to happen. Usability testing for mobile apps includes stand-by and interruption tests as those are essential parts of user experience that might go smoothly or break everything really fast. In a modern life stand-by mode is used often. There are calls, messages and other interruptions happening all the time. You need to find a tool to check how the app maintains while it enters or leaves the standby mode. The way it happens should go in accordance with the app’s tasks and spare users’ annoyance. Also, test the interruption scenarios. Any notification from any different application may impact your app. Your task is to imitate other apps trying to push around to make sure that no interruption can crash or freeze your app. Another key testing objective here is the battery. Usability testing for mobile apps must keep paying attention to battery throughout the whole process. It is perfect to start the testing routine while the device is fully charged. Thus, you will be able to monitor the battery drain. Also, don’t forget about the battery-save mode as it may disable some hardware features of the gadget and influence the application as well. All of them can be used by the mobile application to perform some operations. 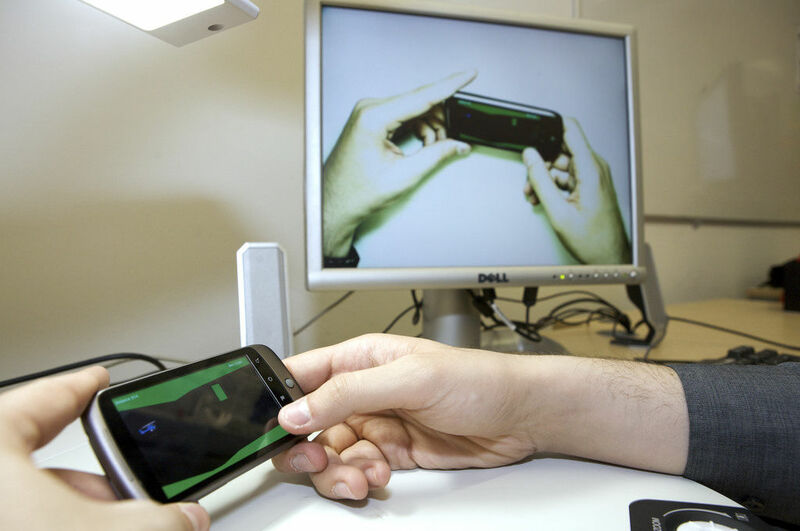 It means that your mobile usability testing tools should include ones to test those sensors. Try different light, environments, temperatures, etc. Just think of anything that can impact the app and try to catch all the bugs related to different sensors. Also, test the app against all the hardware features such as display, camera, microphone, and others. For example, if your app allows to make a picture and download it somewhere, check how it works with cameras from different manufacturers. Don’t assume that if it works on iphone, it works anywhere. It is most likely not true (you may be lucky, but double-checking won’t harm). Usability testing of mobile applications is not something done overnight (you might have noticed it by this point). If you checked once and no troubles were found there means only that you need to change your approach. There are many UI elements, and each of them should be clear and understandable from several points of view. In case there is ever an error, there should also be a message explaining how to solve it right away. It is a part of great usability as nobody can ever count on absolutely error-free performance. It’s better to be familiar with several usability guidelines to make sure that the check is rather more than less subjective. More to that, it is always great to ask potential users for their advice. You can find some of them and invite to answer some questions about the interface that might help you make it better. Don’t hesitate to get as much information as needed, this might be the case when better safe than sorry. To make sure everything fine, check security as well. Most users feel sensitive about anything happening with their personal data. Unless you have very clear permission requirements, the app might not be even installed by such customers. Any business that values personal data gets more respect, so it’s always worth working on it. If your app needs to reach the camera, it should request it without asking to reach messages or calendar. Common sense rules work pretty fine here. The process of thorough testing is not limited to the usability testing. There are tons of scenarios that need to be checked before the release, so it is always safer to hire a specialist who can check all the details and all the angles.